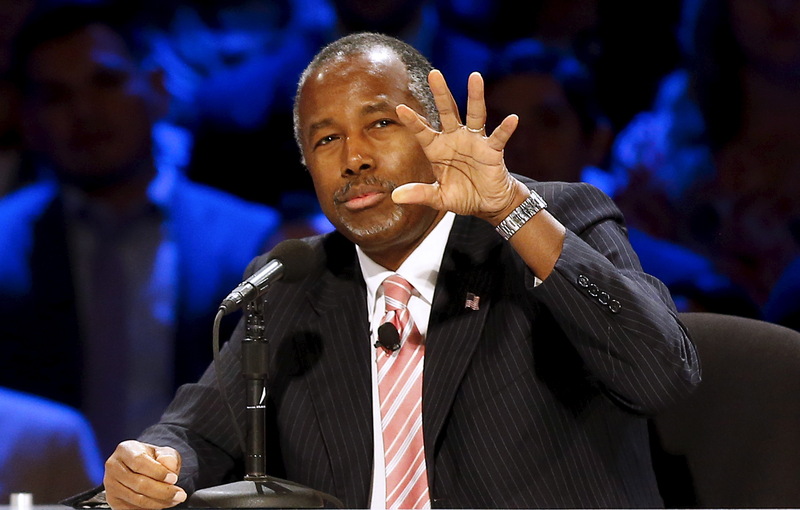 Ben Carson is leading the Republican presidential pack, according to a new Wall Street Journal/NBC News survey. The poll found 29 percent of GOP primary voters back Carson, a retired neurosurgeon, while 23 percent said they support Donald Trump for the nomination. Sen. Marco Rubio, Florida, is also in double digits, with 11 percent support. Sen. Ted Cruz, Texas, came in fourth with 10 percent, and former Florida Gov. Jeb Bush received 8 percent support. The latest numbers are similar to a recent CBS News/New York Times poll that found 26 percent backed Carson, 22 percent supported Trump and 8 percent said they preferred Rubio. An earlier WSJ/NBC News poll from mid-October showed Trump in the lead, with 25 percent support, while Carson trailed with 22 percent support. Thirteen percent said they backed Rubio, nine percent said they backed Cruz and eight percent said they wanted Bush. On the Democratic side, the poll found 62 percent of Democratic primary voters said they support Hillary Clinton for the nomination, up from 58 percent in October. Thirty-one percent now said they support Sen. Bernie Sanders, I-Vt., compared to the 33 percent who said the same last month. Only three percent of Democratic voters said they would support former Maryland Gov. Martin O'Malley. More than 80 percent of Democrats said they could see themselves supporting Clinton for the nomination while only 61 percent said the same about Sanders. Eighty-four percent said Clinton is the most likely to win the nomination and only 12 percent said Sanders would win. Eighty-one percent said Clinton has the best shot of any Democratic candidate of winning the White House next November. Following the 11-hour Benghazi hearing Clinton testified at a few weeks ago, 72 percent of Democratic voters said they're now satisfied with her answers about the 2012 terrorist attack and 8 percent said they weren't satisfied. Before the hearing, 58 percent said they were satisfied with her answers. Nearly half of Democratic voters now say Clinton's use of a personal email server while she served as secretary of state is not important to their decision and 42 percent said the controversy is important to their vote. The Democratic poll surveyed 1,000 adults between October 25 and 29 with a +/- 3.1 percent margin of error. For the Republican portion, 400 GOP primary voters were surveyed during the same period, which was both before and after last week's third Republican presidential debate. That portion had a margin of error of +/- 4.9 percentage points. A Monmouth University survey released Tuesday found Clinton has taken the lead in New Hampshire, receiving 48 percent support compared to Sanders' 45 percent support. Sanders led Clinton 43 percent to 36 percent in the last Monmouth University poll from September. The new poll surveyed 403 New Hampshire voters who are likely to vote in the Democratic primary with a margin of error of +/- 4.9 percentage points.